On April 5 NASA scientists launched sounding rocket mission AZURE (Auroral Zone Upwelling Rocket Experiment) from Norway’s Andoya Space Center. Twin rockets deployed chemical tracers capable of allowing researchers to track the flow of neutral and charged particles during an active geomagnetic storm. Emergency service switchboards were inundated with UFO sighting hysteria – seems no one bothered to alert residents of AZURE’s chemical meddling. 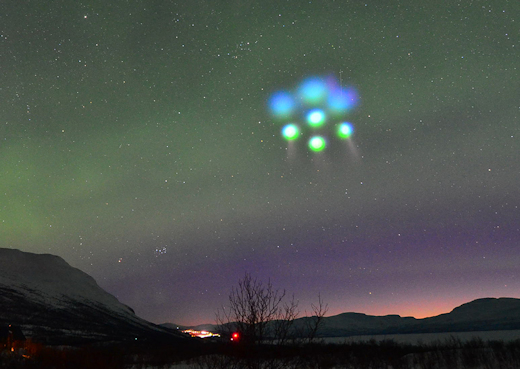 Lights over Lapland webcam operator Chad Blakely captured the first chemical puffs. Video below from Adrien Mauduit documents the spectacle. It began with a routine check of space weather before bed. I say routine because it used to be daily ritual until a few months ago when work took siege of every waking moment. Not so long ago I would have been all over a geomagnetic storm, auroras are my thing and I miss them. SpaceWeather http://spaceweather.com/ told of “the next geomagnetic storm”, Earth’s exit from one solar stream and anticipated arrival of another on November 18. Oh man, what solar stream? Then I remembered Adrien Mauduit, newly discovered astro-photographer and visionary whose efforts warm my heart. Sure enough, Mauduit not only knew of last weekend’s solar storm, he captured its ethereal beauty in HD.